I made this birthday card for PPA#82, Elements of Style-Scallops, and with the Clean and Simple FTL#129 here. 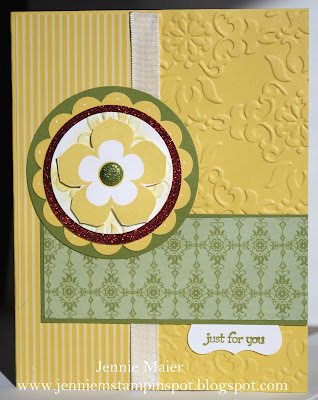 The base is Daffodil Delight card stock and I added DSP from the Sweet Stitches DSP. I ran some Daffodil Delight thru the Scallop Edge Border punch. I cut out a Daffodil oval with the Coluzzle Oval cutter and ran that thru the Perfect Polka-dot textured impressions embossing folder. 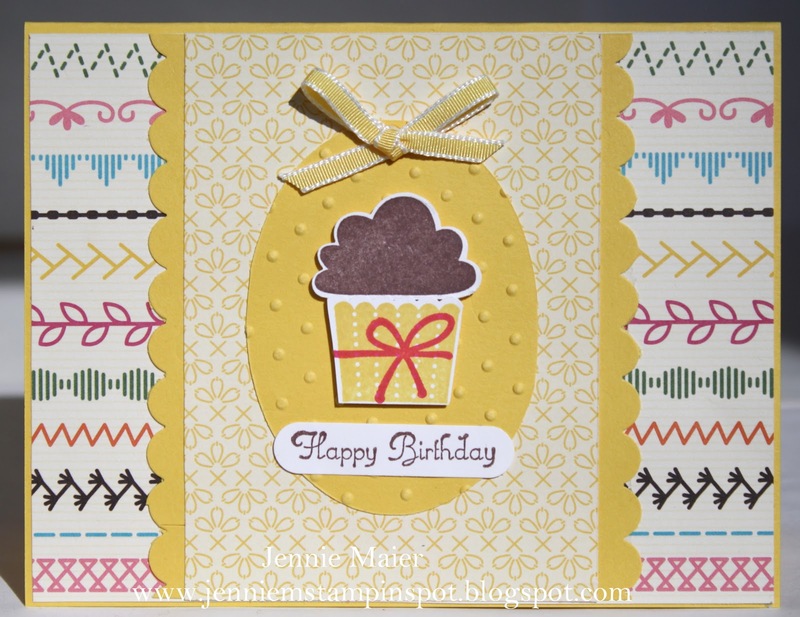 I stamped the cupcake bottom from Create a Cupcake in Daffodil and added a Melon Mambo bow. The top was stamped in Chocolate Chip, as was Happy Birthday. I used the Build a Cupcake punch to punch out the cupcake and the Word Window punch for the sentiment. 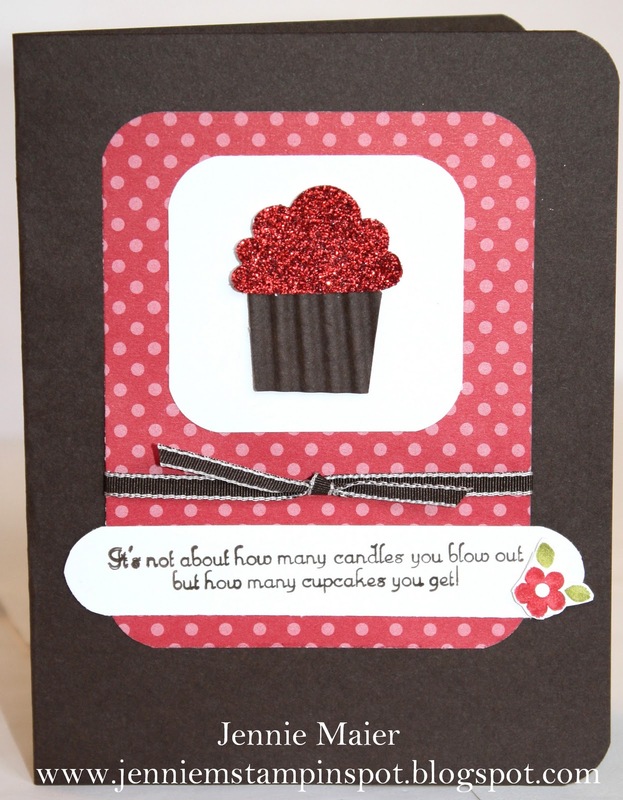 I popped up the cupcake with Stampin dimensionals. Finally, some 1/8 inch Daffodil Delight taffeta ribbon finishes it off. I used the Splitcoast Sketch Challenge#321 here to make this card. 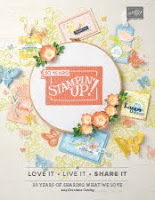 The stamp set is Tart and Tangy, which you can earn for FREE during Sale-a-bration with a $50 order! And I paired that stamp set with the SAB Ice Cream Parlor DSP, again FREE with a $50 order. I started with a base of Peach Parfait card stock and added two of the patterned papers from the Ice Cream Parlor DSP. I used my Chocolate Chip, Melon Mambo, Peach Parfait and Old Olive Stampin' Write markers to color the Tart & Tangy stamps and stamped them all on Whisper White. I used the 1 1/4 inch Large Square punch to punch them out. I then layered them onto Melon Mambo, Old Olive or Peach Parfait card stock that was punched with the 1 3/8 inch XL Square punch. I popped up all the squares with Stampin' dimensionals. I stamped "just for you" from Teeny Tiny Wishes in Peach Parfait on Whisper White, punched it out with the Word Window punch and trimmed down one edge. Finally, some 1/2 inch Peach Parfait stitched-poly ribbon finishes it off. 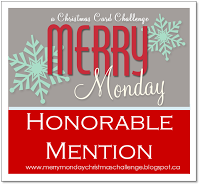 I'm thrilled to say that I am today's Guest Designer for the Stampin' Celebration Inspiration Challenge #41 here. All these gals are soooo talented and I'm honored to be chosen this week! The green printed tablecloth caught my eye, so I immediately thought of using the Perfect Details Texturz Plate on some Old Olive card stock. I added some Old Olive DSP from the Patterns DSP Brights Stack. I had to get some pink in my card too, so I started with a Melon Mambo card stock base. I added a touch of black with the Basic Black card stock and stamped the image from A Flower for All Seasons in Basic Black. I then colored it in with the Daffodil Delight, Melon Mambo, Old Olive and Soft Suede Classic pads and Blender pens. The basket piece was matted with Melon Mambo, Old Olive and Basic Black then popped up with Stampin' dimensionals. I stamped thank you from Short and Sweet in Old Olive and punched it out with the Word Window punch. I added an Old Olive piece punched with the Modern Label punch. Finally, some 5/8 inch Old Olive Satin Ribbon finishes it off. I made this birthday card with the MojoMonday sketch#179 here and for the SUO Challenge#13, Sale-a-bration Creations here. I started with a Melon Mambo base, added some Daffodil Delight and then some Ice Cream Parlor DSP. I also used some of the Ice Cream Parlor Quick Accents. I punched a Melon Mambo piece with the 2 3/8 inch XL Scallop Circle punch and a Daffodil Delight piece with the 1 3/4 inch XL Circle punch. I trimmed down some DSP for the horizontal piece and added some more Quick Accents. I used my Melon Mambo Stampin Write marker to color the sentiment from So Happy For You, masking it off so that I could stamp it vertically rather than horizontally. I popped up the sentiment and the scallop circle piece with Stampin dimensionals. Finally, I added three little circles from the Quick Accents to the upper right corner. I made this birthday card for the Stamping 411 Sketch#191 here. 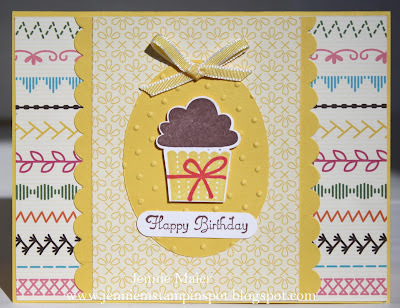 I took this sketch literally and used the Build a Cupcake punch and Create a Cupcake stamp set for my focal point. The base is Real Red card stock and I added some Celebrations DSP. I punched out some more DSP with the Build a Cupcake punch for the cupcake bottom. I stamped the top in Pacific Point. I punched that and the candles out with the Build a Cupcake punch. 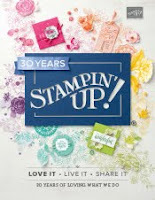 The cupcake is popped up with Stampin dimensionals. I stamped the sentiment from Bring on the Cake in Pacific Point and colored it in with my Pear Pizzazz, Real Red and Bashful Blue Stampin Write markers. I stamped the star from So Happy For You in Pear Pizzazz, punched it out with the 1/2 inch Circle punch and popped it up with a Stampin dimensional. Finally, some 1/2 inch Pear Pizzazz stitched-poly ribbon finishes it off. After a busy weekend of basketball and volleyball games and a birthday party I'm back to stamping- yeah! I made this quick one for the Clean and Simple Stamping FTL#128 here. 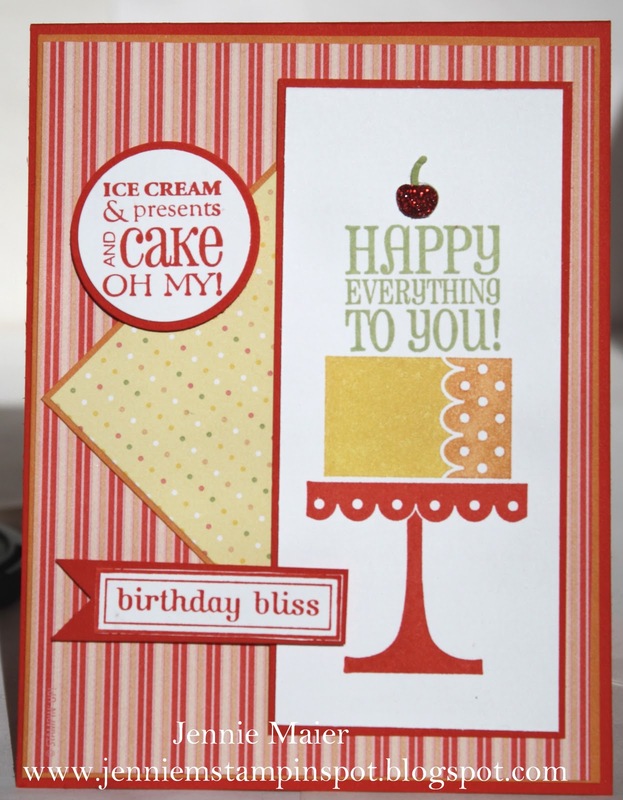 The base is Melon Mambo card stock and I added some papers from the SAB Ice Cream Parlor DSP and Quick Accents. I cut out the Whisper White piece with the Matchbox Bigz XL Die. 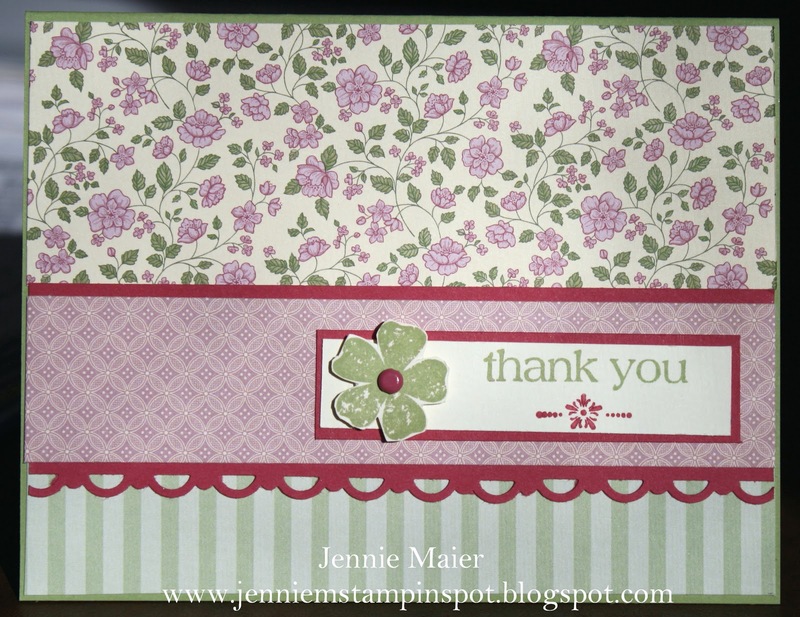 I stamped thanks from So Happy For You in Melon Mambo and added a flower and circle from the Ice Cream Parlor Quick Accents. 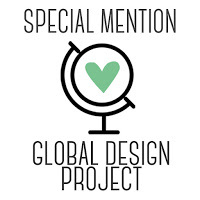 Finally, I popped up the Whisper White die with some Stampin dimensionals. This card with Daffodil Delight was made using the PPA Sketch Challenge#81 here and the Stampin' Celebration Inspiration Challenge#40 here. I started by running the Daffodil Delight base thru the Big Shot with the Vintage Wallpaper textured impressions embossing folder. I added some striped Daffodil and some Old Olive DSP from the Patterns DSP Brights Stack. I punched out the large Old Olive circle with the 2 1/2 inch XL Circle punch. The 2 3/8 inch XL Scallop Circle punch was used for the Daffodil Scallop. 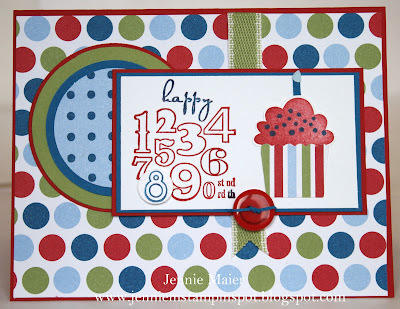 I punched out some Red Glimmer paper with the Circles#2 Big Shot die. The 1 3/4 inch Large Circle punch was used for the Whisper White circle. I also ran that thru the Vintage Wallpaper folder and sponged on some Daffodil Delight. I stamped the flower from Petal Pizzazz in Daffodil on Whisper White and cut it out. 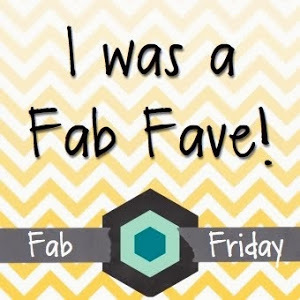 I added an Old Olive Glitter brad to the center and popped it up with Stampin dimensionals. Just for you from Teeny Tiny Wishes was stamped in Old Olive and punched out with the Curly Label punch. Finally, some 3/8 inch Very Vanilla taffeta finishes it off. 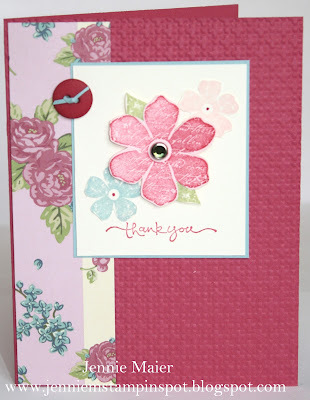 This card, using the stamp set For All You Do and Sunny Garden DSP, was made with the Splitcoast Card Sketch#320 here. I started with a base of Peach Parfait and added some Sunny Garden DSP, matting the Poppy pattern with Poppy Parade and then the others with more Peach Parfait. I used my Stamp-a-ma-jig to position the brackets and sentiment and stamped them in Peach Parfait. The stem was stamped in Pear Pizzazz. I stamped the flowers in Poppy Parade, Peach Parfait and Daffodil Delight. 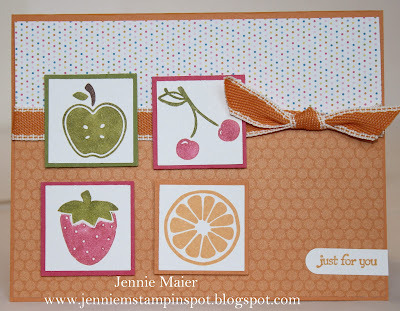 I cut them out and popped the Peach one up with Stampin dimensionals. I also added a Pumpkin Circle Fire brad to the center of the Peach flower. Finally, some 1/2 inch Poppy Parade stitched-poly ribbon finishes it off. This birthday card for my nephew, Jack was made with the MojoMonday sketch#178 here. The base is Real Red card stock and then I added some Celebrations DSP. I used the 2 1/2 inch XL Circle punch for the Real Red circle and the 1 3/4 inch XL Circle punch for the DSP circle. The Circles#2 die was used for the Pacific Point circle and the Coluzzle Circle cutter for the Pear Pizzazz one. I colored the stamp from Bring on the Cake with my Pacific Point and Real Red Stampin Write markers. I colored the "8" again with the Pacific Point marker, punched it out with the 1/2 inch Circle punch and popped it up with Stampin dimensionals. I punched out the cupcake bottom with some Celebrations DSP and the Build a Cupcake punch. 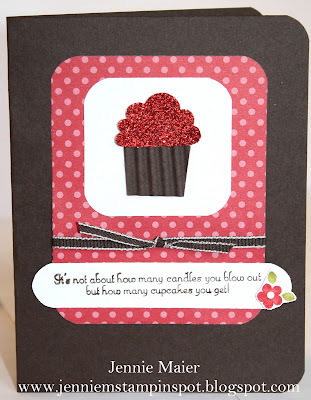 I stamped the frosting from Create a Cupcake in Real Red and sprinkles in Pacific Point. I punched that and the Pacific Point and Bashful Blue candle out with the Build a Cupcake punch. I threaded a Real Red Designer Button with some Pacific Point. Finally, I added some 1/2 inch Pear Pizzazz stitched-poly ribbon and notched out the end. 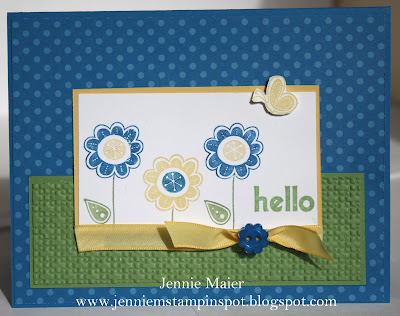 This bright Hello card was made with the Stamping 411 Sketch#190 here and the Splitcoast Color Challenge #310 here. The colors to use are Pacific Point, So Saffron and Wild Wasabi. I began with a Pacific Point card stock base and added some DSP from the Patterns DSP Brights Stack. 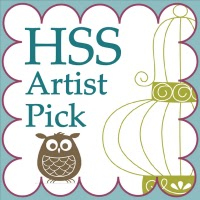 I ran a piece of Wild Wasabi thru the Big Shot with the Square Lattice textured impressions embossing folder. 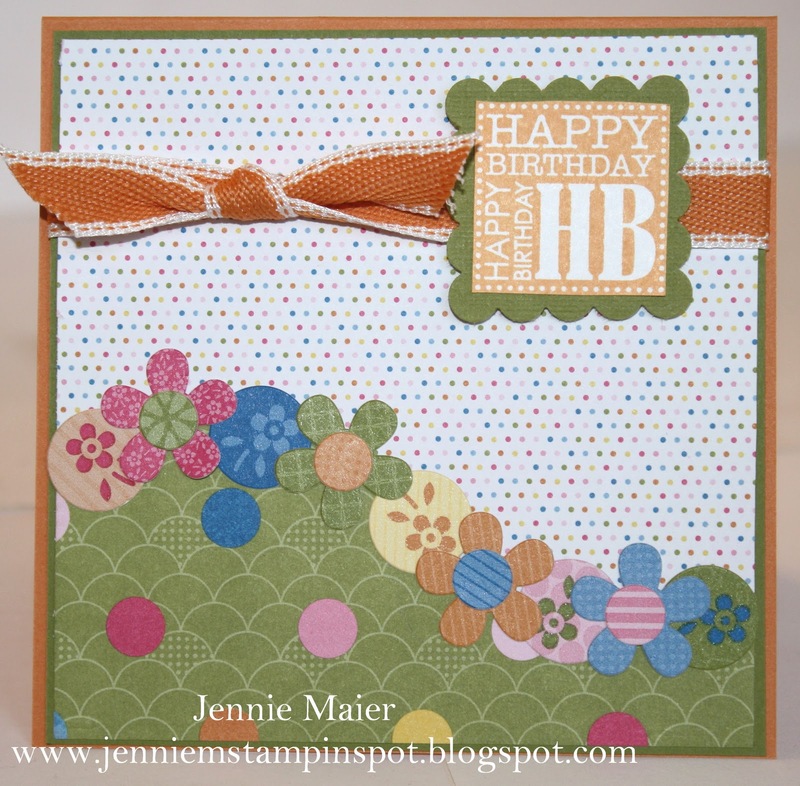 I colored the flowers from Hello Again with my Pacific Point, So Saffron and Wild Wasabi Stampin Write markers. I stamped hello in Wild Wasabi. The butterfly was stamped in So Saffron, cut out and popped up with Stampin dimensionals. I added some 3/ 8 inch Daffodil Delight taffeta ribbon. Finally, an Ice Cream Parlor button in Pacific Point finishes it off. I made these cute 3 by 3 Valentines for my three kids and used the Stampin' Celebration Inspiration Challenge #39 here. 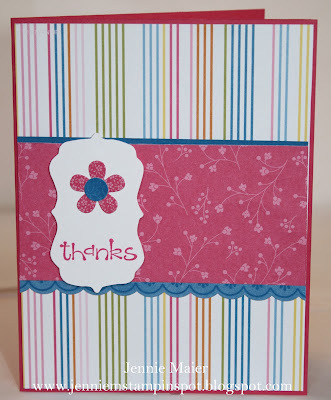 I used Pretty in Pink and Real Red card stock for bases and added DSP from the Patterns DSP Brights and Subtles Stacks. The middle card uses the Love Impressions Rub-ons and I punched out the Love You with the 3/4 by 15/ 16 inch Oval punch and popped it up with Stampin dimensionals. For the pink cards I stamped the cupcake bottoms from Create a Cupcake in Pretty in Pink on Whisper White. The frosting and bow were stamped in Soft Suede. They were punched out with the Build a Cupcake punch. I then stamped the heart in Pretty in Pink and cut it out. The entire cupcake was popped up with Stampin dimensionals. Finally, I used the sentiment from Love Impressions Rub-ons and adhered it to a Soft Suede piece punched with the Modern Label punch. 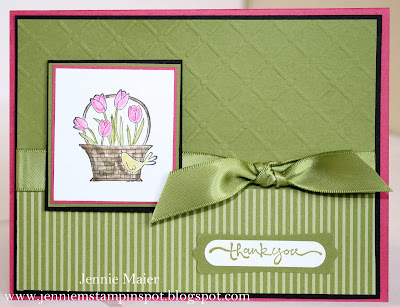 This Thank You came together pretty quickly thanks to the Clean & Simple Stamping FTL#127 here, and the Create with Connie and Mary Color Challenge #137 here. Since the colors in the challenge are Rose Red, Pink Pirouette, Baha Breeze and Pear Pizzazz I had to use the Springtime Vintage DSP! 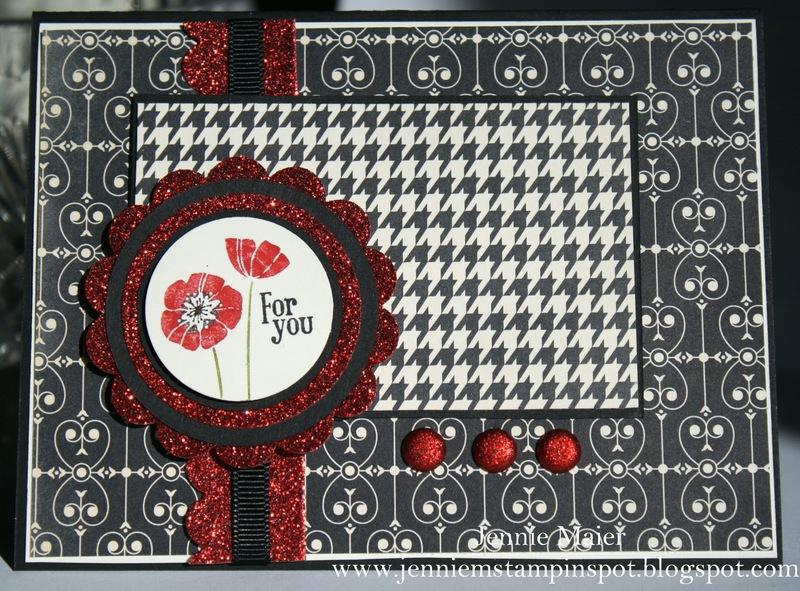 The Rose Red card stock was run thru the Big Shot with the Square Lattice textured impressions embossing folder. Then I added a strip of the Springtime Vintage DSP. I stamped the big flower from Vintage Vogue on Pink Pirouette card stock in Rose Red. The little flowers were stamped on Very Vanilla in Pink Pirouette and Baha Breeze. And the leaves were stamped in Pear Pizzazz. I added a Circle Ice Rhinestone brad to the center flower and popped it up with Stampin dimensionals. I threaded a retired Rose Red button with a sliver of Baha Breeze. Finally, thank you from Short and Sweet was stamped in Rose Red. I made this card for the MojoMonday sketch#177 here. 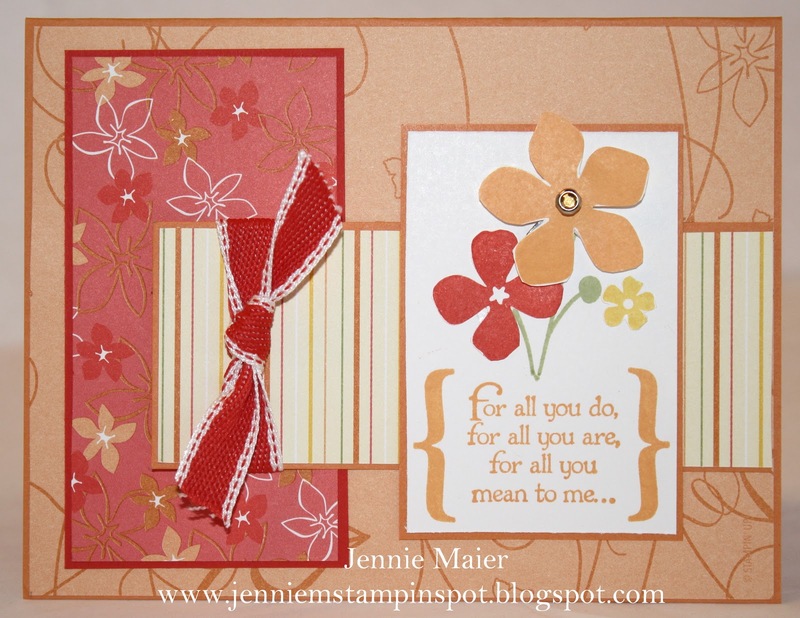 I started with Poppy Parade card stock and added some Peach Parfait then papers from the Sunny Garden DSP. I used my Stamp-a-ma-jig to stamp the images from On A Pedestal. The cake stand was stamped in Poppy Parade, the present inked up with Daffodil Delight and Peach Parfait Stampin Write markers and the greeting inked up with Pear Pizzazz. 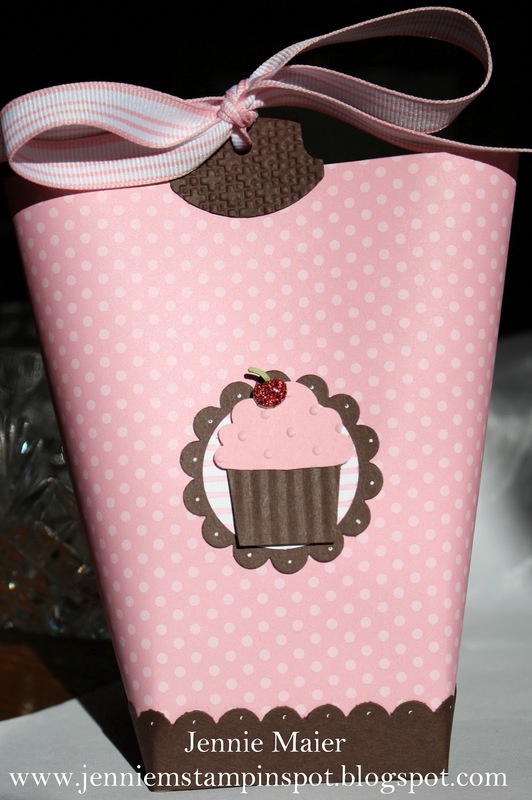 I used the Build a Cupcake punch to punch out the cherry with Red Glimmer paper and the stem with Pear Pizzazz. 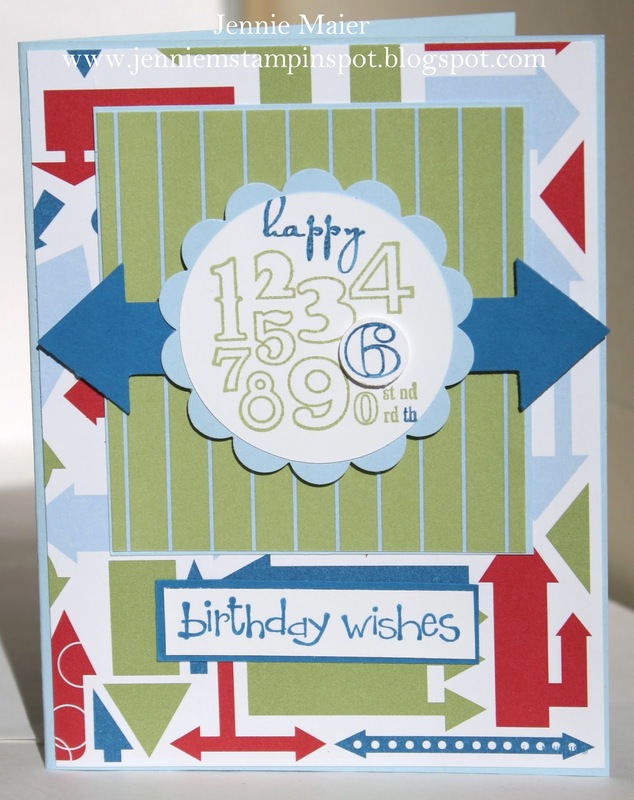 The greetings in both the circle and the pennant are from Birthday Bliss and were inked up with Poppy Parade and stamped on Whisper White. The top one was punched with the 1 1/4 inch Circle punch and layered onto a Poppy Parade piece punched with the 1 3/8 inch Circle punch. I trimmed down the birthday bliss, matted it with Poppy Parade, and snipped it into the pennant shape. 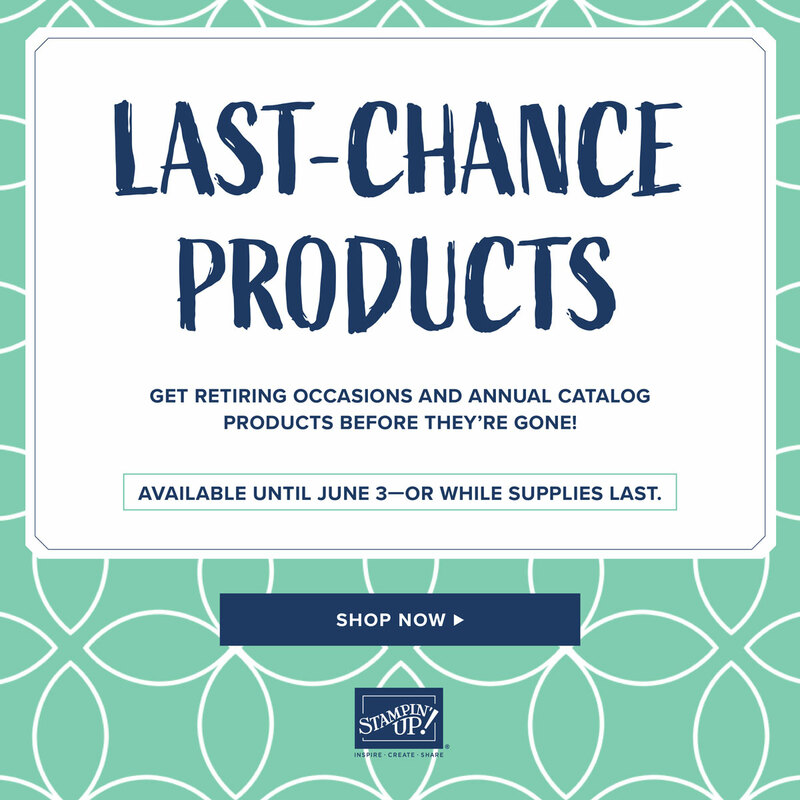 The pennant and circles were popped up with Stampin dimensionals. I had some time to stamp today so I got a head start on some upcoming birthday cards that I'll need. I made this one with the Clean & Simple FTL#126 here. The base is Bashful Blue and the papers are from Celebrations DSP. 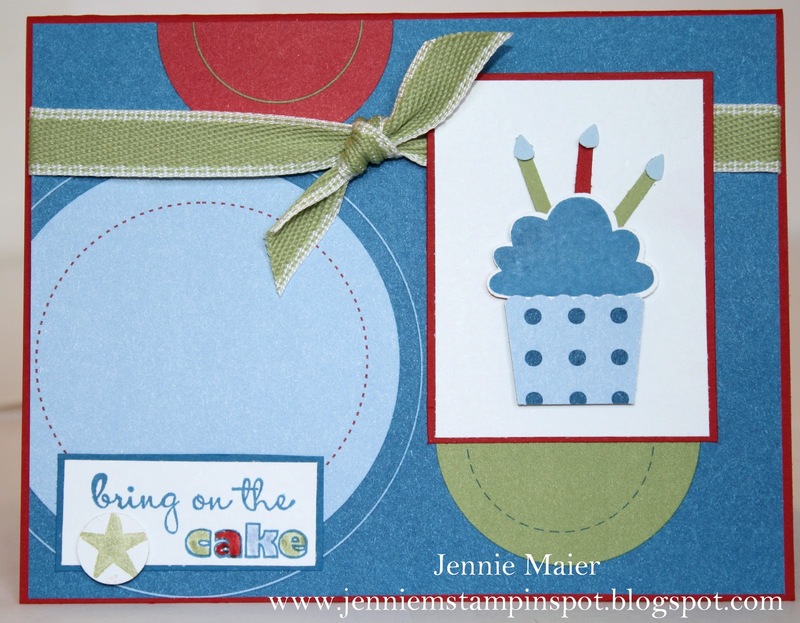 I colored the stamp from Bring on the Cake with my Pacific Point and Pear Pizzazz markers and stamped in on a Whisper White circle that I cut out with the Circles #2 Big Shot die. 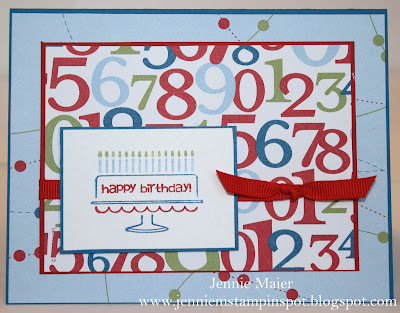 I stamped the number six again, punched it out with the 1/2 inch Circle punch and popped it up with Stampin dimensionals. That circle was layered onto a Bashful Blue piece punched with the 2 3/8 inch XL Scallop Circle punch. I used my the retired My Way punch to punch the Pacific Point arrows. Birthday Wishes from So Happy For You was stamped in Pacific Point on Whisper White and matted onto a piece of Pacific Point. This is my take on a sketch and a Vintage theme. The sketch I used is the Splitcoast Sketch Challenge #319 here, and thetheme is the PPA#80 Vintage Theme here. I started with a card stock base of Pear Pizzazz and added papers from the Springtime Vintage DSP. I colored the thank you stamp from With All My Heart with the Pear Pizzazz and Rose Red Stampin Write markers and stamped it on Very Vanilla. I stamped the flower from Vintage Vogue in Pear Pizzazz, cut it out and added a Rose Red brad to the center, popping it up with Stampin dimensionals. Finally, I ran a piece of Rose Red card stock thru the Scallop Trim Border punch. This is a really quick one for the Stamping 411 sketch#189 here. The base is Tempting Turquoise and I added some Sweet Stitches DSP. Then I cut out some more Sweet Stitches DSP for the main panel and matted it with Daffodil Delight and Tempting Turquoise.A strip of Daffodil Delight was run thru the Dotted Scallop Ribbon Border punch. 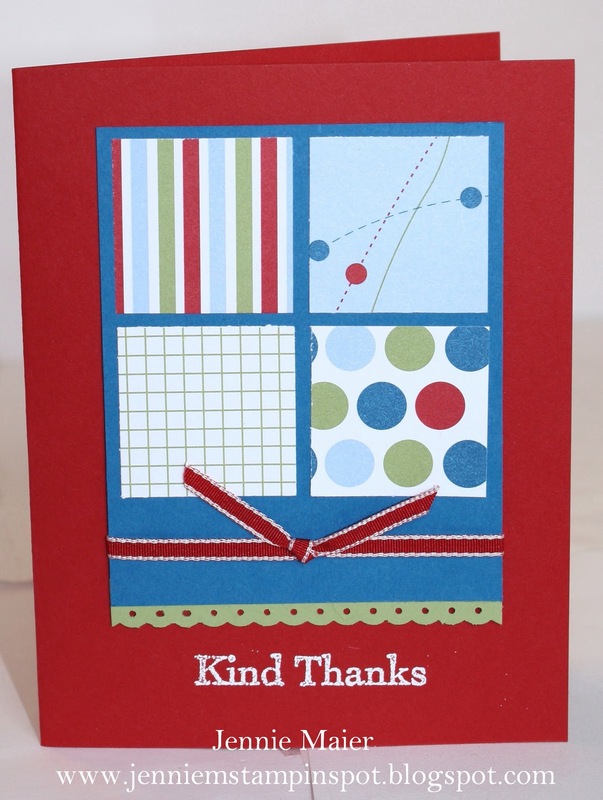 I stamped thinking of you from Teeny Tiny Wishes in Tempting Turquoise and punched it out with the Curly Label punch. I added a Daffodil button from the Ice Cream Parlor Ribbon & Button Pack. Finally, some 3/8 inch Daffodil Delight taffeta finishes it off. Here's a quick card that I made for a customer that uses the Celebrations DSP. I think it could make a nice birthday card too by just changing the sentiment. The base is Real Red card stock. I used the 1 3/8 inch Square punch to punch out the papers from the Celebrations DSP then matted that on a piece of Pacific Point. I ran a strip of Pear Pizzazz thru the Dotted Scallop Ribbon Border punch. 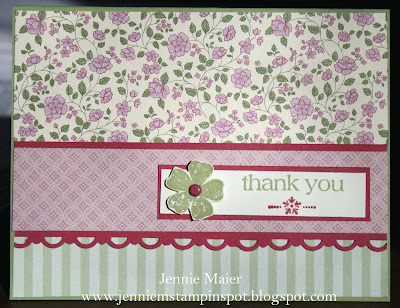 I stamped Kind Thanks from Thank You Kindly in Whisper White Craft ink and added some White Embossing powder. Finally, some 1/8 inch Real Red taffeta finishes it off. I made this cute cupcake Birthday Box in a Bag for my sister's birthday present. I used the tutorial at Splitcoast here. The trim is Chocolate Chip card stock and I ran the bottom piece thru the Scallop Edge border punch and added some White Gel pen dots. The Pretty in Pink paper is from the Patterns DSP Subtles Stack. The handles were punched with the XL Round Tab punch and ran thru the Big Shot with the Square Lattice textured impressions embossing folder. I punched a Chocolate Chip piece with the 1 3/4 inch XL Scallop Circle punch and added white dots again. I stamped Solid Stripes in Pretty in Pink Classic Ink on Whisper White and punched it out with the 1 3/8 inch Large Circle punch. I used the Build a Cupcake XL Punch to punch out the cupcake. The Chocolate Chip bottom was also run thru the Crimper. The Pretty in Pink top was run thru the Big Shot with the Perfect Polka-dot textured impressions folder. And the cherry was punched with Red Glimmer paper and Pear Pizzazz. The entire cupcake was popped up with Stampin dimensionals. Finally, I punched the tabs with the 1/16 inch Circle punch and added some retired 1/2 inch Pretty in Pink striped grosgrain. I used lots of Red Glimmer paper for this card! 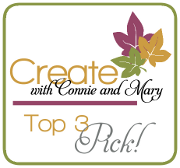 I made it with the Create with Connie and Mary sketch#136 here, and the Stampin' Celebration Inspiration Challenge#38 here. I chose to use the colors Basic Black, Real Red and Very Vanilla. The base of the card is Basic Black card stock. I added some Very Vanilla then DSP from the Love Letter DSP. I colored in the stamp from Punch Bunch with my Basic Black, Old Olive and Real Red Stampin Write markers then punched it out with the 1 3/8 inch Circle punch and popped it up with Stampin dimensionals. Both Basic Black circles were cut out with the Circles#2 Big Shot die. The Red Glimmer circle was punched out with the 1 3/4 inch XL Circle punch and the Red Glimmer scallop was punched with the 2 3/8 inch XL Scallop Circle punch. I ran a piece of the Red Glimmer paper thru the Scallop Edge Border punch and layered on some 1/4 inch Basic Black grosgrain. Finally, three Real Red Glimmer brads finish it off. This is my try at the PPA#79 Color Challenge here. After I made this card and took the picture, I realized I'd used Pear Pizzazz instead of Certainly Celery! Oh well, close enough, right? The base is Rich Razzleberry and I added some DSP from the Patterns DSP Brights Stack. I then cut out a Pear Pizzazz card stock and DSP from the DSP Pack In-Color, and Whisper White Top Note with the Big Shot. I trimmed down the Whisper White and DSP pieces. I stamped the images from Circle Circus in Riding Hood Red, Rich Razzleberry and Pear Pizzazz. 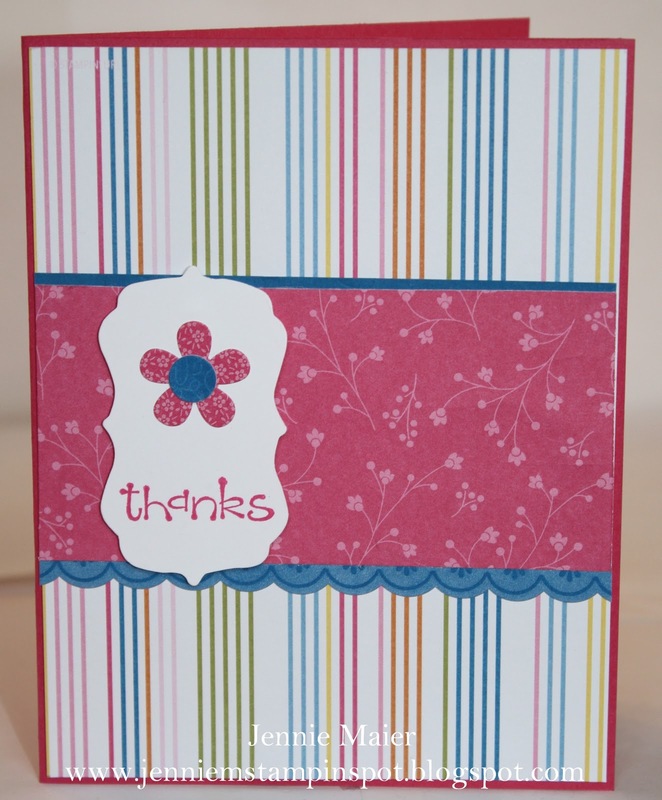 I also stamped "thanks" from So Happy For You in Pear Pizzazz and punched it out with the Curly Label punch. I added a Rich Razzleberry Glimmer brad to that piece. Finally, some 1/4 inch Rich Razzleberry grosgrain ribbon finishes it off. We survived the Blizzard of 2011! 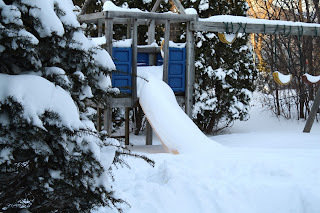 We're enjoying a snow day today thanks to over a foot plus of snow(see below). Our Internet was down most of the day too, so I'm finally posting this quick and cute card I made for the Splitcoast Sketch Challenge#318 here. I started with Pacific Point card stock and added papers from the Celebrations DSP. 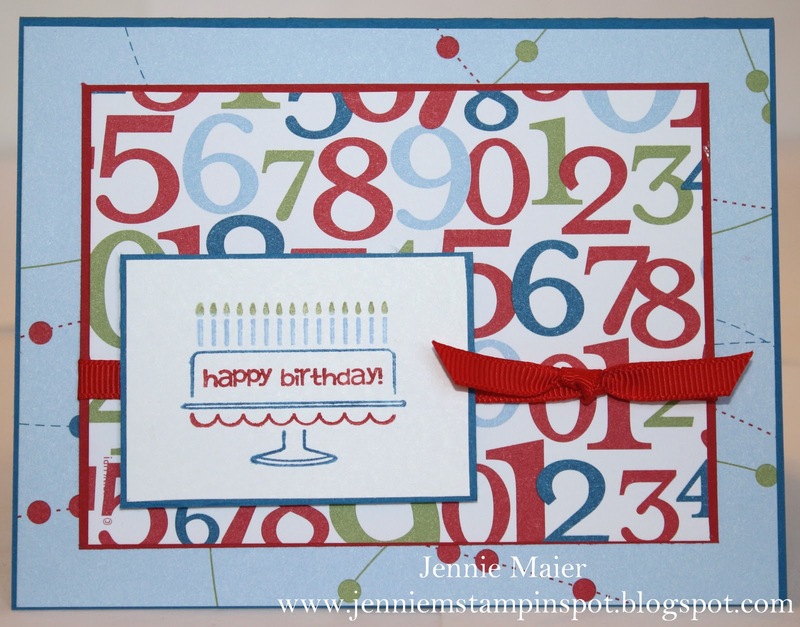 I colored in the birthday cake stamp from Bring On the Cake with my Bashful Blue, Pear Pizzazz, Pacific Point and Real Red Stampin Write markers and stamped it on Whisper White.I matted that with Pacific Point and popped it up with Stampin dimensionals. Finally, some 1/4 inch Real Red grosgrain finishes it off. Our backyard after the Blizzard of 2011! I had to play with the new-to-me set, Create a Cupcake and coordinating Build a Cupcake punch. So I made this quick and cute card for the Stampin' Connection Inspiration Challenge #37 here. The base is Early Espresso and I used the 3/16 inch Small Corner rounder punch on the corners. I added some Real Red DSP from the Patterns DSP Brights Stack and rounded those corners too. I also rounded the corners of the Whisper White square. I punched the cupcake wrapper in Early Espresso with the Build a Cupcake punch and ran it thru the crimper. The "frosting" was punched with the punch too and some yummy, why didn't I have it sooner, Red Glimmer paper. I popped the entire cupcake up with Stampin dimensionals. 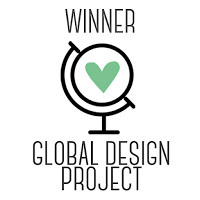 The sentiment was stamped in Early Espresso and I rounded that piece too. I used my Real Red and Old Olive Stampin write markers to color in the flower from Create a Cupcake, cut it out and pop it up with Stampin dimensionals. Finally, some 1/8 inch Early Espresso taffeta finishes it off. I made this card for the MojoMonday sketch#176 here. It uses a stamp from the SAB Punch Bunch set and DSP and Accents from the Ice Cream Parlor DSP & Quick Accents. The base is Peach Parfait card stock and I added some Old Olive. Then I added two papers from the Ice Cream Parlor DSP. 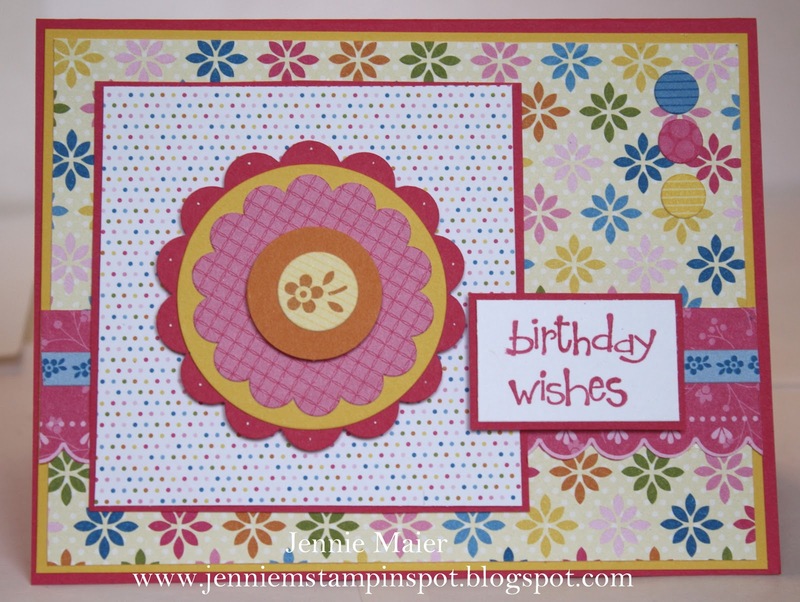 I used the flower and circles from the Quick Accents to form the border between the papers. I inked up the Happy Birthday stamp from Punch Bunch in Peach Parfait, stamped it on Whisper White and trimmed it down. 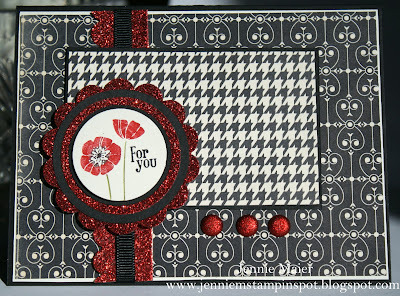 I added an Old Olive piece punched with the Scallop Square punch and popped it up with Stampin dimensionals. Finally, some 1/2 inch Peach Parfait stitched poly ribbon finishes it off.